In today’s age, the electric power industry (also known at the energy industry) is paramount to the running of our day to day lives. From the running of our own homes to the businesses and factories that we may work in; it is hard to imagine we once lived in a world without electricity. Electrical power can be generated by a few different methods including: oil stations, gas stations, fossil fuel stations, biomass plants, cogeneration systems and nuclear power plants to name a few. Regardless of your type of energy generation plant, to encourage smooth running and continuous production you need to make sure your plant equipment is in top quality condition without any signs of material build up from production. 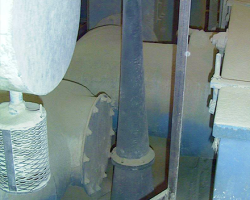 Our acoustic cleaning technology offers lots of benefits for all types of power generation plants. 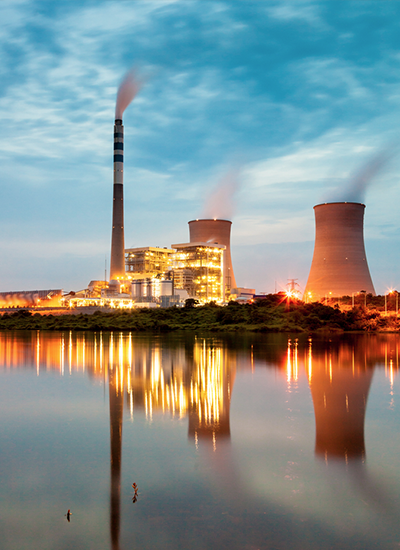 Improve the efficiency of your power plant operations. Certain energy production plants, most notably coal power, produce a lot of dangerous carbon in the form of smoke and ash. It is fundamental that power plants try keep these dangerous fuels to a minimum and remove any particulate build up that may cluster within the production or equipment walls. 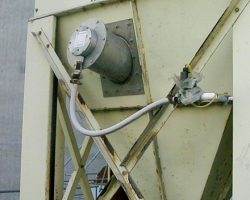 Ensuring appropriate removal of particulate matter goes hand in hand with plant down time. Capital investments are huge within the power generation industry, so many plants cannot afford to have excessive amounts of down time. Time means money within the industry, therefore particulate buildup should be avoided at all costs and removed effective immediately following identification. Not only does it encourage longer downtime, but it does not maximise the full use of products. Investments are at their highest within the nuclear industry and cannot go to waste, therefore it comes as no surprise that government or investor owned plants want to get the most out of the rare, expensive and potentially hazardous materials that are used during production. Products within this industry are not so easy to come by and should be processed to the highest possible degree, minimising product wastage in the form of build-up. Of course, completely avoiding material build-up is not fully possible and doesn’t come with great ease, however additional measures can be put into place to minimise the degree of particle aggregation such as Primasonics’ Acoustic Cleaning equipment. Improve the safety within your power plant. Federal, state and local laws state that you must remove emission contaminants to a high standard from plants and factories. Airborne pollutants that are produced within the power generation industry from nuclear plants, coal plants and so-on pose health risks to workers around. These dangerous by-products such as ash and smoke can provoke concerning health defects from allergic reactions to mild irritation when workers come into contact with them, especially over prolonged periods of time. Naturally, proper attire should be provided to workers within these plants to minimise exposure, however the wellbeing of your workers should be your priority within such a hazardous environment. Therefore, having additional measures put into force such as an acoustic cleaning horn will not only benefits your plant’s productivity, but promotes a safer working environment for your employees which in turn boosts morale. 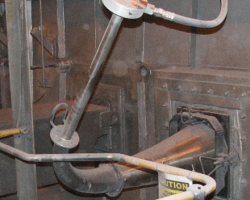 Our Acoustic Cleaners can be fitted to prevent the accumulation of hazardous ash and particulate matter, allowing predictable amounts of fuel to be fed to the furnace and freeing site staff from reactive maintenance of removing build up, and instead allowing them to carry out preventive maintenance. Additionally, our specialist equipment can potentially reduce costs of more expensive pollution control equipment being installed, or, to fully maximise efficiency, they can be installed in conjunction with pollution control equipment. The ‘power’ of sound energy. The sound energy produced from the acoustic horns creates fluctuations of static gas particles which helps to loosen and remove particulate deposits situated in the gas stream. When the air begins to oscillate, it dislodges the buildup. Our cleaning solutions are especially effective in plant environments where mechanical or manual cleaning methods are ineffective, thus preventing a prolonged build up. Within this industry, many plants opt for the installation of soot blowers or rapping systems, however trials and tests have shown that the oscillations caused from our Acoustic Horns is more effective, with the former only managing to do so much in terms of build-up removal. Reduce sootblowing frequency - save money and energy. Reduce maintenance requirements - boost staff safety and plant efficiency. Reduce operating costs - do not need continuously handled over time. Discover how Primasonics can help. If you have material build up problems and work in the power generation industry please email us with details and we will be happy to consider your case and try and identify a way in which we can help you. Due to their rapid rise in popularity, acoustic cleaning methods are now highly advanced and thoroughly tested. 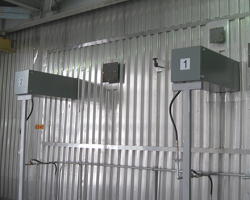 Our range of infrasonic devices are safe for installation and will not damage any plant equipment. 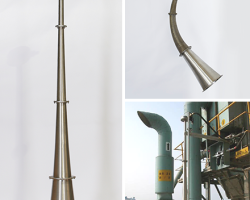 We can have our horns tailor made to suit specific industrial environments to maximise their effectiveness while respecting the calibration of your plant structure and equipment. Our horns optimize the different factors of each individual plant to produce visible results. Some people worry it either won’t work or the sound will be too intense, this is not the case; however if this is a concern for you please don’t hesitate to contact a member of the team. We will gladly handle your queries and discuss installation and/or our no-hassle, try before you buy scheme.